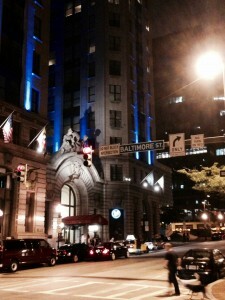 Hotel Monaco – This boutique hotel is located right in the heart of Baltimore’s historic district, and it could not be a more pet-friendly place! Harkening back to the old grandeur of the city, the hotel features practically cavernous common spaces combined with a retro interior (thick tapestries and carpets of intricate geometric patterns and designs). Our room was equally grand with a beautiful modern bath, and it also had its share of welcoming materials for the pups. Bowls of food and water were waiting for Galileo and Otis when we arrived, along with a goody bag of a few biscuits, a poop bag, and information for pup parents about nearby locations for dog walks. Right around the corner, there is a large grassy area in a park center, and only a couple of blocks down the road is a gated dog park (though dogs are required to remain on leash). 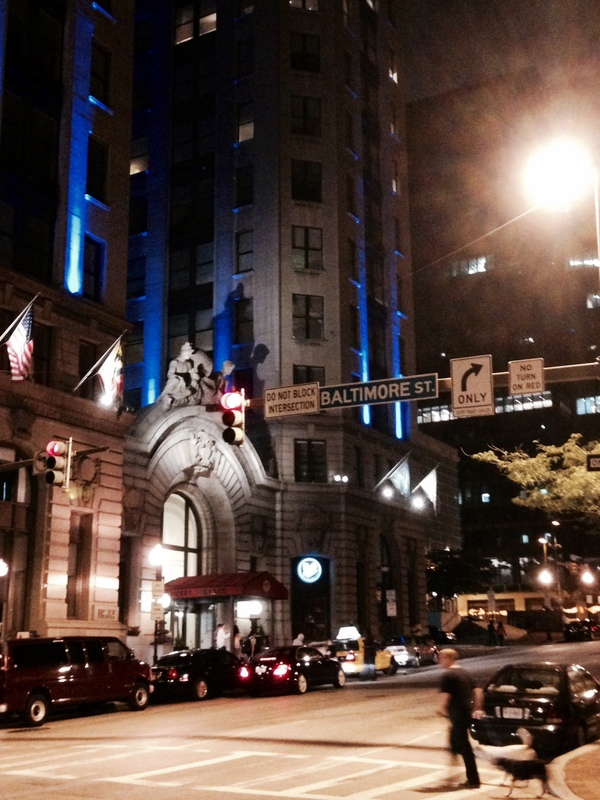 The best walk, however, is just minutes away: a five-minute walk takes you to the city’s waterfront and Harborplace. Plenty of grassy areas, and the pier along the water is the perfect setting for a family walk. On a mild summer Saturday evening, Harborplace was a hub of activity — people of all ages strolling along, others enjoying some outdoor dining, and a few street performers entertaining the crowd — but it was still easy enough to navigate the pups along this charming center of restaurants and shops. One more thing to say about what’s so great about Hotel Monaco, part of the Kimpton hotel group: from 2004 to 2014, Klimpton has received a score of 100% on the Corporate Equality Index by the Human Rights Campaign (HRC). The Corporate Equality Index is the national benchmarking tool on corporate policies and practices pertinent to lesbian, gay, bisexual and transgender employees. Kudos! 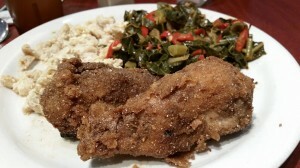 Land of Kush – Vegan soul food! This unassuming, tiny place is AWESOME. I took the plunge and went with the Lush BBQ Ribs (soy protein). Honestly, I’ve never been one for the sticky sweetness of barbecue sauce, but I couldn’t resist trying these and, on the same plate with sides of Baked Mac ‘n Cheese and Smoked Collard Greens… wow… it was so different from the kinds of things I usually eat and SO tasty! Seth, meanwhile, had vegan “Drummies” that are seasoned breaded soy served on a stick. Fried chicken has nothing on these cruelty-free alternatives! We also sampled sides of fresh Seasoned Green Cabbage and the delicious Potato Salad made with vegan mayo. Add a slice of cornbread to complete the experience, and I highly recommend the Ginger Spice beverage if you’re getting the BBQ — the slightly bitter taste of ginger really complements the sweet sauce. If that’s not your thing, there’s always the freshly-squeezed lemonade. The only thing that could have made our dinner at this little vegan haven even better: if it happened about a week later, we could have been savoring our soul food when Stevie Wonder stopped in to grab a bite. Now that definitely earns Kush some extra Cool Quotient points. Other noteworthy places: If you’re in the city on a Saturday morning, check out Sweet Duke’s Vegan Bakery, which surfaces at he Fell’s Point Farmers Market. And, if you love your bagels as much as our family does (and we happened to be in Baltimore on Sunday morning, which is traditionally our weekly bagel breakfast), be happy to know that there are a couple of Goldberg’s Bagels nearby. We discovered Goldberg’s in East Hampton last summer: great bagels and Tofutti cream cheese is on the menu. 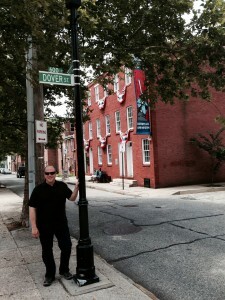 Babe Ruth Birthplace and Museum – Of course, this New Yorker is a Yankees fan. And, just across from the Oriole Park at Camden Yards is the birthplace of Babe Ruth. But you don’t have to be an avid baseball fan to appreciate this place — you’re sure to to leave feeling uplifted and inspired, regardless of what team you root for, if any at all. The museum is housed in what was once the Babe’s grandparents’ home and a neighbor’s row house. It’s small but so well done, incorporating not only the history of the legendary baseball player (and other members of the “500 Club”), but also the history of Baltimore’s other big claim to fame — the Star-Spangled Banner, which was written by Francis Scott Key after witnessing a battle at the city’s port. The origin of the anthem ties in well with the baseball stuff here: Babe Ruth was playing at the Chicago game (Cubs playing the Red Sox) when the song was first played during the seventh inning stretch. Seth and I spent about an hour and a half here, which was a great way to start our day before checking out of the Monaco and driving the rest of the way home. 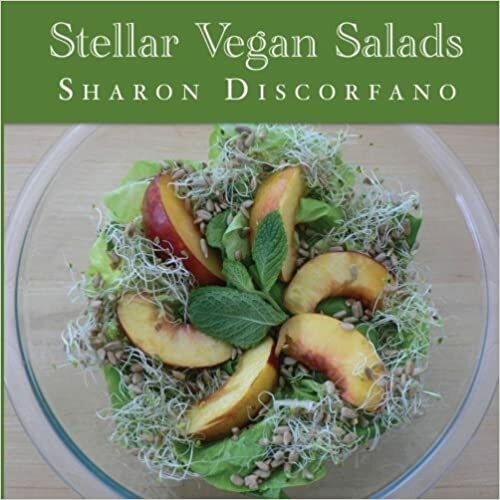 Have you seen my new book, Stellar Vegan Salads yet? Available now on Amazon and also for your iPad. Check out sample pages and order your copy today!